When I think of self-financed albums I think of garage bands that put aside some hard-earned summer money to fulfill the lifetime dream of releasing their own CD and becoming a rock stars. But let’s not kid ourselves here, most of the time the music is so immature and skills level so low, not to mention horrible production, that other than few of their close friends nobody hears about them ever again. Not making any exception, that was exactly my first thought when I received Desire’s self-financed “Locus Horrendus” but... even without playing it the first look at their press kit told me there’s something special about this band. Professional press kit and the sticker on the cover saying “Mastered at Finnvox Studio by Mika Jussila (Nighwish, Therion, Children of Bodom,...)” assured me whatever that is those five Portuguese guys believe in themselves and are ready to go an extra step to make sure we get the best quality they can afford. Enough of the package it’s music that counts... and what can I say? 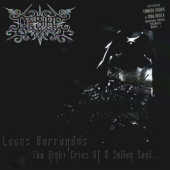 “Locus Horrendus” is one of the best atmospheric/dark/doom metal releases I had listen to in years. Over an hour long of deep and depressing music doesn’t bore and considering the genre it’s quite a feat in itself. Track after track, powerful but sorrow guitar chords laid upon dazzling keyboard sections create a very gloomy and mystical surrounding that satisfies grieving souls and lets the mind drift to its darkest places. Combination of brutal male grunts and occasional female vocals mixed with spoken words and all kinds of mournings and whispers are perfectly fitted with the music of Desire and only intensify already invoking atmosphere. With “Locus Horrendus” Desire proves that dark and melancholic is their first name and it’s just a matter of time until they’ll master their craft to the level no one will even touch. From production through music and lyrics, thoughtful and intelligent arrangements characterize this release and even though Desire’s “Locus Horrendus” is not their first offering it is an example of how any band, no matter what style, should introduce music onto the world. Bottom Line: By saying that from all self-released discs I received this year nothing comes even close to Desire’s “Locus Horrendus” would be an understatement, those guys knocked over most of this year releases period, and either they don’t want to sign a deal with a major record label or there’s something terribly wrong with today’s music industry.